The Continental Army consisted of soldiers from all 13 colonies, and after 1776, from all 13 states. When the American Revolutionary War began at the Battles of Lexington and Concord in April 1775, the colonial revolutionaries did not have an army. Previously, each colony had relied upon the militia, made up of part-time citizen-soldiers, for local defense, or the raising of temporary “provincial regiments” during specific crises such as the French and Indian War. As tensions with Great Britain increased in the years leading up to the war, colonists began to reform their militia in preparation for the potential conflict. Training of militiamen increased after the passage of the Intolerable Acts in 1774. Colonists such as Richard Henry Lee proposed creating a national militia force, but the First Continental Congress rejected the idea. * The Continental Army of 1775, comprising the initial New England Army, organized by Washington into three divisions, six brigades, and 38 regiments. Major General Philip Schuyler’s ten regiments in New York were sent to invade Canada. * The Continental Army of 1776, reorganized after the initial enlistment period of the soldiers in the 1775 army had expired. Washington had submitted recommendations to the Continental Congress almost immediately after he had accepted the position of Commander-in-Chief, but these took time to consider and implement. Despite attempts to broaden the recruiting base beyond New England, the 1776 army remained skewed toward the Northeast both in terms of its composition and geographical focus. This army consisted of 36 regiments, most standardized to a single battalion of 768 men strong formed into eight companies, with a rank and file strength of 640. * The Continental Army of 1777-80 was a result of several critical reforms and political decisions that came about when it was apparent that the British were sending massive forces to put an end to the American Revolution. 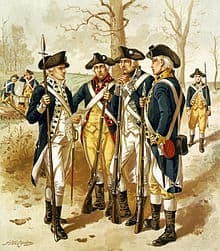 The Continental Congress passed the “Eighty-eight Battalion Resolve”, ordering each state to contribute one-battalion regiments in proportion to their population, and Washington was subsequently given authority to raise an additional 16 battalions. Also, enlistment terms were extended to three years or “the length of the war” to avoid the year-end crises that depleted forces (including the notable near collapse of the army at the end of 1776 which could have ended the war in a Continental, or American, loss by forfeit). * The Continental Army of 1781-82 saw the greatest crisis on the American side in the war. Congress was bankrupt, making it very difficult to replenish the soldiers whose three-year terms had expired. Popular support for the war was at its all-time low, and Washington had to put down mutinies both in the Pennsylvania Line and New Jersey Line. Congress voted to cut funding for the Army, but Washington managed nevertheless to secure important strategic victories. * The Continental Army of 1783-84, was succeeded by the United States Army, which persists to this day. As peace was closed with the British, most of the regiments were disbanded in an orderly fashion, though several had already been diminished. At the time of the Siege of Boston, the Continental Army at Cambridge, Massachusetts, in June 1775, is estimated to have numbered from 14-16,000 men from New England (though the actual number may have been as low as 11,000 because of desertions). Until Washington’s arrival, it remained under the command of Artemas Ward, while John Thomas acted as executive officer and Richard Gridley commanded the artillery corps and was chief engineer. The British force in Boston was increasing by fresh arrivals. It numbered then about 10,000 men. Major Generals Howe, Clinton, and Burgoyne, had arrived late in May and joined General Gage in forming and executing plans for dispersing the rebels. Feeling strong with these veteran officers and soldiers around him—and the presence of several ships-of-war under Admiral Graves—the governor issued a proclamation, declaring martial law, branding the entire Continental Army and supporters as “rebels” and “parricides of the Constitution.” Amnesty was offered to those who gave up their allegiance to the Continental Army and Congress in favor of the British authorities, though Samuel Adams and John Hancock were still wanted for high treason. This proclamation only served to strengthen the resolve of the Congress and Army. Throughout its existence, the Army was troubled by poor logistics, inadequate training, short-term enlistments, interstate rivalries, and Congress’s inability to compel the states to provide food, money or supplies. In the beginning, soldiers enlisted for a year, largely motivated by patriotism; but as the war dragged on, bounties and other incentives became more commonplace. Two major mutinies late in the war drastically diminished the reliability of two of the main units, and there were constant discipline problems. Planning for the transition to a peacetime force had begun in April 1783 at the request of a congressional committee chaired by Alexander Hamilton. The commander-in-chief discussed the problem with key officers before submitting the army’s official views on 2 May. Significantly, there was a broad consensus of the basic framework among the officers. Washington’s proposal called for four components: a small regular army, a uniformly trained and organized militia, a system of arsenals, and a military academy to train the army’s artillery and engineer officers. He wanted four infantry regiments, each assigned to a specific sector of the frontier, plus an artillery regiment. His proposed regimental organizations followed Continental Army patterns but had a provision for increased strength in the event of war. Washington expected the militia primarily to provide security for the country at the start of a war until the regular army could expand—the same role it had carried out in 1775 and 1776. Steuben and Duportail submitted their own proposals to Congress for consideration. Although Congress declined on 12 May to make a decision on the peace establishment, it did address the need for some troops to remain on duty until the British evacuated New York City and several frontier posts. The delegates told Washington to use men enlisted for fixed terms as temporary garrisons. A detachment of those men from West Point reoccupied New York without incident on November 25. When Steuben’s effort in July to negotiate a transfer of frontier forts with Major General Frederick Haldimand collapsed, however, the British maintained control over them, as they would into the 1790s. That failure and the realization that most of the remaining infantrymen’s enlistments were due to expire by June 1784 led Washington to order Knox, his choice as the commander of the peacetime army, to discharge all but 500 infantry and 100 artillerymen before winter set in. The former regrouped as Jackson’s Continental Regiment under Colonel Henry Jackson of Massachusetts. The single artillery company, New Yorkers under John Doughty, came from remnants of the 2nd Continental Artillery Regiment. Washington believed that the blending of persons from every colony into “one patriotic band of Brothers” had been a major accomplishment, and he urged the veterans to continue this devotion in civilian life. Washington said farewell to his remaining officers on December 4 at Fraunces Tavern in New York City. 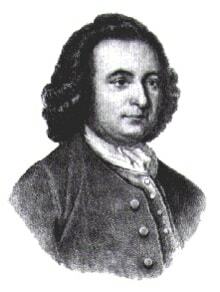 On December 23 he appeared in Congress, then sitting at Annapolis, and returned his commission as commander-in-chief: “Having now finished the work assigned me, I retire from the great theatre of Action; and bidding an Affectionate farewell to this August body under whose orders I have so long acted, I here offer my Commission, and take my leave of all the employments of public life.” Congress ended the War of American Independence on January 14, 1784 by ratifying the definitive peace treaty that had been signed in Paris on September 3. Congress had again rejected Washington’s concept for a peacetime force in October 1783. When moderate delegates then offered an alternative in April 1784 which scaled the projected army down to 900 men in one artillery and three infantry battalions, Congress rejected it as well, in part because New York feared that men retained from Massachusetts might take sides in a land dispute between the two states. Another proposal to retain 350 men and raise 700 new recruits also failed. On June 2 Congress ordered the discharge of all remaining men except twenty-five caretakers at Fort Pitt and fifty-five at West Point. The next day it created a peace establishment acceptable to all interests. The plan required four states to raise 700 men for one year’s service. Congress instructed the Secretary at War to form the troops into eight infantry and two artillery companies. Pennsylvania, with a quota of 260 men, had the power to nominate a lieutenant colonel, who would be the senior officer. New York and Connecticut each were to raise 165 men and nominate a major; the remaining 110 men came from New Jersey. Economy was the watchword of this proposal, for each major served as a company commander, and line officers performed all staff duties except those of chaplain, surgeon, and surgeon’s mate. Under Josiah Harmar, the First American Regiment slowly organized and achieved permanent status as an infantry regiment of the new Regular Army. The lineage of the First American Regiment is carried on by the 3rd United States Infantry Regiment (The Old Guard). However the United States military realised it needed a well-trained standing army following St. Clair’s Defeat on November 4, 1791, when a force led by General Arthur St. Clair was almost entirely wiped out by the Western Confederacy near Fort Recovery, Ohio. The plans, which were supported by U.S. President George Washington and Henry Knox, Secretary of War, led to the disbandment of the Continental Army and the creation of the Legion of the United States. The command would be based on the 18th-century military works of Henry Bouquet, a professional Swiss soldier who served as a colonel in the British army, and French Marshal Maurice de Saxe. In 1792 Anthony Wayne, a renowned hero of the American Revolutionary War, was encouraged to leave retirement and return to active service as Commander-in-Chief of the Legion with the rank of Major General. The legion was recruited and raised in Pittsburgh, Pennsylvania. It was formed into four sub-legions. These were created from elements of the 1st and 2nd Regiments from the Continental Army. These units then became the First and Second Sub-Legions. The Third and Fourth Sub-Legions were raised from further recruits. From June 1792 to November 1792, the Legion remained cantoned at Fort LaFayette in Pittsburgh. Throughout the winter of 1792-93, existing troops along with new recruits were drilled in military skills, tactics and discipline at Legionville on the banks of the Ohio River near present-day Baden, Pennsylvania. The following Spring the newly named Legion of the United States left Legionville for the Northwest Indian War, a struggle between American Indian tribes affiliated with the Western Confederacy in the area south of the Ohio River. The overwhelmingly successful campaign was concluded with the decisive victory at the Battle of Fallen Timbers on August 20, 1794, Maj. Gen. Anthony Wayne applied the techniques of wilderness operations perfected by Sullivan’s 1779 expedition against the Iroquois. The training the troops received at Legionville was also seen as an instrumental to this overwhelming victory. Nevertheless Steuben’s Blue Book remained the official manual for the legion, as well as for the militia of most states, until Winfield Scott in 1835. In 1796, the United States Army was raised following the discontinuation with the legion of the United States. This coincided with the graduation of the first cadets from United States Military Academy at West Point, New York, which had been established in 1794.